I started this project months ago, progress has been slow. The reason is that the 5dc is a bit unique. It runs VxWorks, but has a lot of similarities to modern DryOS cameras. As a result, simply porting Magic Lantern or 400plus was not an option, I had to start fresh. EDIT The 5dc will work on the unified tree! Big thanks to A1ex for the help in making this happen. Blink LEDs from user FIR file boot. Enable bootflag for autoexec.bin booting. Port BMP routines from ML for screen printing. Port menu system from ML. Fix fonts to be sized correctly on screen. Fix up properties and property handlers from ML. Begin porting all non-lv features from ML (intervalometer, audio triggering, trap focus, etc). 2.) Double check that you are running v1.1.1 firmware. 3.) One more time make sure that you are running v1.1.1 firmware! 4.) Charge battery to 100% and remove any battery grip for the install procedure. 5.) Download the zip file from the link below, unzip all of the files to your CF card. 7.) Launch the firmware update process. If you see any red led, then something went wrong. A solid blue led means that the bootdisk is now enabled. A blinking blue led means the bootdisk is now disabled (if you want to completely uninstall ML). Each time you run the firmware update it just toggles the bootdisk to the opposite of whatever it is currently. The installer FIR will make your CF card bootable for you, no further work required here. 8.) Turn the power switch off and pull your battery to turn the camera off. Just turn the camera on (make sure autoexec.bin and ML directory are on the card!) and you're all set. Press the Trash button to bring up the ML menu. You only need to run the firmware update to enable the bootflag ONCE. Each time after that will only disable, re-enable, disable, re-enable, etc. the bootflag. - exposure bracketing: shutter, ISO, flash; 2x0.5 ... 9x5EV; auto mode (covers the entire dynamic range). Basically, this is what we can achieve on 5Dc with our current knowledge. For more, one needs to dig deeper in the firmware and reverse engineer it. The camera is about 7 years old if I'm not mistaken - but simply the fact that it runs a large subset of the same ML code designed for DIGIC 4 cameras, is amazing! Big thanks to Alex for this release! He found the missing VRAM buffers which enabled a lot of features in playback mode. - Changed boot code from how it's done in the ROM to how it's done in the firmware update flasher code. My camera boots, hope it works for all other 5dcs too. - Updated to latest source tree, nothing changed for 5dc though. - Now included is a FIR file that will only make your card bootable - just run the firmware update and pull your battery when you see the blue LED, your card is now bootable after that. - Potentially very buggy. Try it out, let me know how it works. Many features are disabled because they don't work yet / will never work (obviously all LiveView features). Update: Tackled some more compiler/linker errors today. Slowly making progress on porting the menu system! It should be done by next week. I am from Russia. I follow yours. What you do is amazing. Today the code compiled with menu.c included from magic lantern (well, a modified menu.c, but mostly everything there). That takes care of compiler / linker problems, but the menu doesn't function yet (can't make it draw anything on screen). so, next step is to sort out the drawing problems. In ML, things are drawn to an "idle" vram buffer (a blank space in memory reserved for ML to draw to), and then copied to the real vram. I need to re-work this because the bmp vram is 720x480 in ML, and only 360x240 in the 5dc. If it is possible to port the ML on the Canon 5dc, what features will it? - ML debug tools (memspy, propspy, eventspy). I have already ported bmp_hexdump, it has helped me tremendously so far. Basically most non-lv features from ML. lots of things working thanks to alex. menu now works almost perfectly (including submenus), colors are fixed, help files work, config file is saving, lots of stuff so far! now it's just a matter of getting the features to work 1 at a time. just want to thank you for all you've done. do you think one day it will be possible to get some lv features? I know the processor is probably too slow to encode video but it would be great to have a simple live-view in order to focus easily by night. Hi, have just registered myself here to thank you! 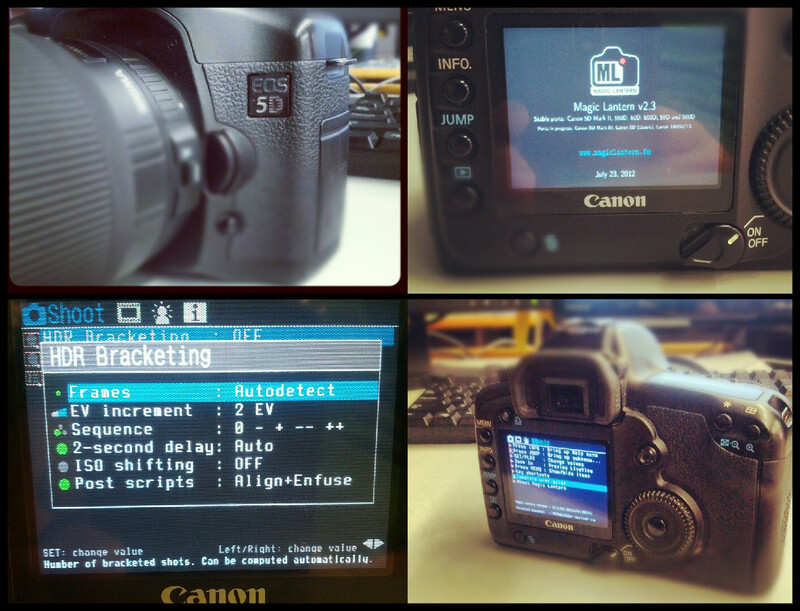 hi guys, i've a 5d classic and i'll do the short movie, it's possible install magic lantern on my camera? help me please. You won't be able to record video on the 5DC since it doesn't have live view mode. New here? Check out the FAQs here! The first thing I want to get working is the intervalometer, the 5dc would be pretty cool for timelapse!